Intrepid divers and explorers can experience some of the richest and unique marine environments in the world, get up close and personal with the ferocious Komodo Dragons and trek up and along the desolate jagged ridges to the peaks of the park’s breathtaking mountainous landscapes. 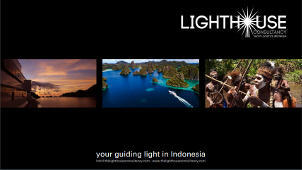 Cruises focusing their entire duration in Komodo National Park usually embark from the busy little port of Labuan Bajo, just over an hour flight from Bali. Labuanbajo’s runway is quite small, so consideration must be given to this fact if private aircraft are to be utilized although at the time of writing a new airport terminal is nearing completion and the runway being lengthened. Private aircraft can also be chartered out of Bali. An alternative embarkation point is the town of Bima to the west of Komodo where the airport has a longer runway. 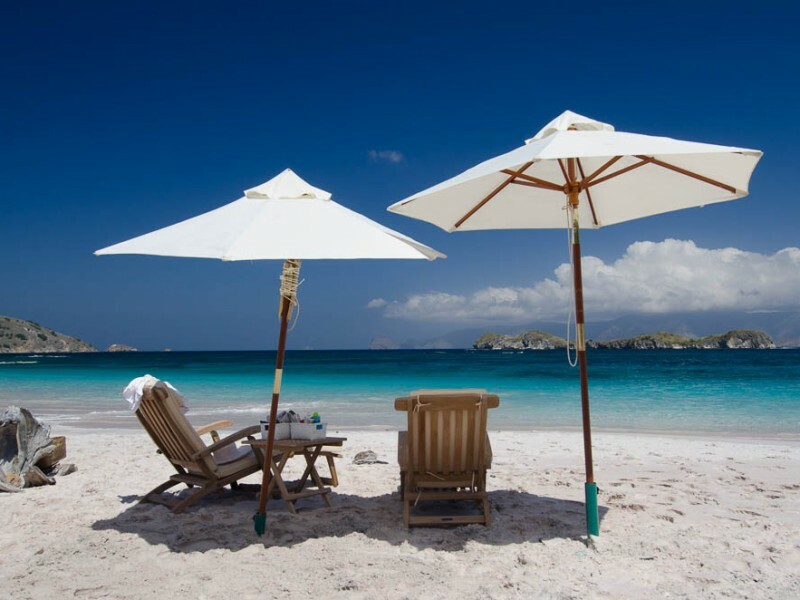 For those with more time, extended cruises can embark from Bali, in which case the journey between Bali and Komodo can be broken up with interesting days of snorkeling and topside exploration of the islands of Lombok, Moyo and Sumbawa. A cruise in Komodo is a journey around one of the most diverse and unique regions of the natural world, a land of dragons and dramatic landscapes, fierce currents and sparkling corals in seas teeming with more marine life than almost anywhere else on the planet, a real-life “Jurassic Park” above and below the surface. While most of Indonesia is green and tropically lush, the Komodo National Park is more arid, the varied landscapes featuring rocky peaks, creature-filled green forests and grassy slopes and meadows that give a savannah type feel to the environment. 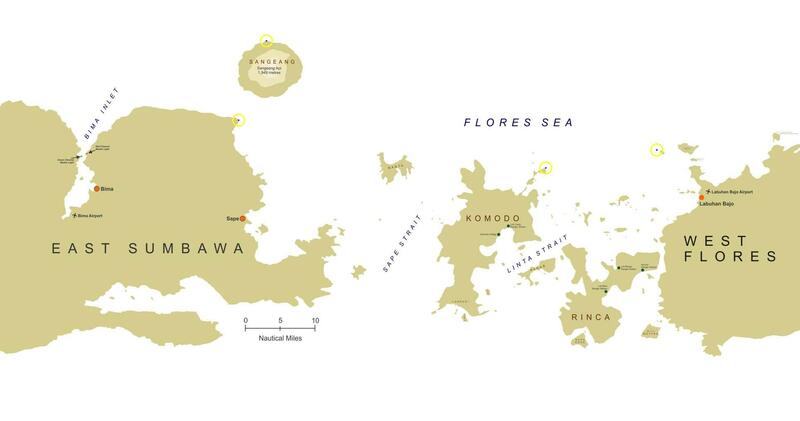 The two largest islands in the park, Komodo and Rinca, are home to many types of land-based fauna too. Snakes are common, especially during the wetter months, and it’s not unusual to come across a cobra, python or green tree viper during a cross-country trek. Wild pigs, boar or deer are plentiful while small groups of goats are resident on some of the smaller islands like Gili Lawah Laut. This combination of habitat and prey creates the perfect habitat for Komodo’s most famous resident, the 150 kilo, three metre man eating Komodo Dragon, the largest lizard on earth. The beaches of the Komodo National Park are a dream, sandy with a background of rocks and hills, and mostly deserted. Great for trekking and beachcombing, however not such a good place for sunbathing – it is important to remember that the other residents of the islands are always searching for a snack. Effortlessly swirling high up in the thermals close to shore, the breathtaking hunting displays by white bellied sea eagles and brahminy kites are a show not to be missed. In the wooded areas, the trees screech, chatter and hoot with green imperial pigeons and yellow crested cockatoos, just some of the birds that make their home in the park. Snakes are a common sight, especially during the wetter months and it is not unusual to come across wild pigs or huge buff alo wallowing in the shady mud pools. The huge island nation of Indonesia is home to the world’s most prolific marine ecosystem and the Komodo National Park is at the epicentre of all this wild activity. In excess of 100 dive sites have been pioneered throughout this spectacular seascape, comprised mainly of volcanic sea mounts, pinnacles, walls, canyons and fringing reefs. The coral gardens, mangrove bays and sandy slopes, create an unmatched variety of very different and distinctive dive environments. 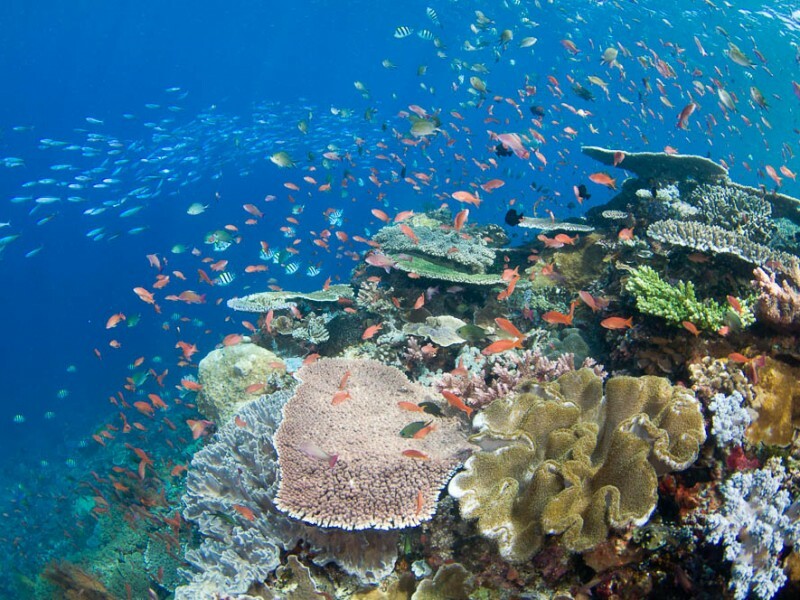 Between the sea mounts the vast coral reefs, often in shallow water, teem with unusual tropical reef animals. 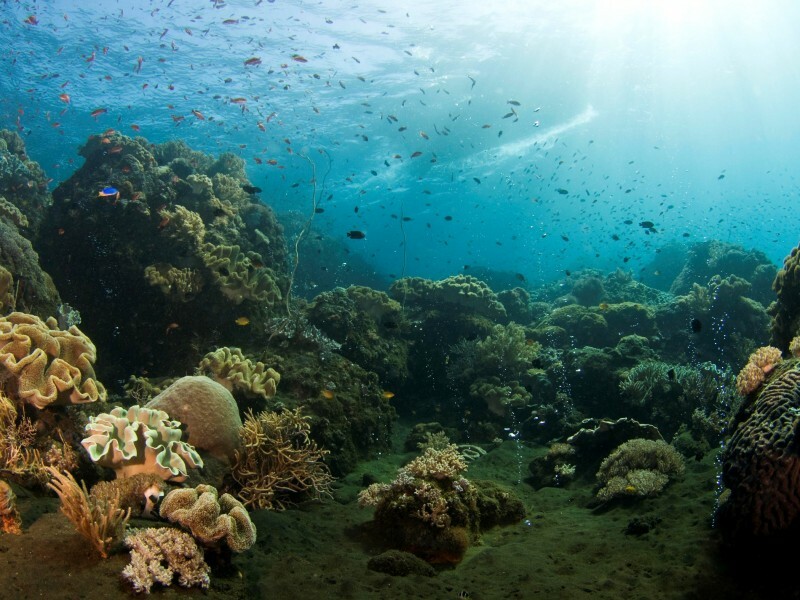 In fact, this area plays host to more than 1,100 different fish species, compared with 300 or 400 in the Caribbean. The list of critter species is significant and for bigger animals, the dive sites with stronger currents play host to manta rays, sharks and many other larger pelagic species. Whales, dolphins and turtles have made the park a playground and even the rare dugong or sea cow can occasionally be spotted in the scattered mangrove forests. North and south Komodo, despite being separated by only 15 nautical miles, offer two distinctly different underwater environments, with the northern area generally consisting of sparkling hard coral gardens and sea mounts, and the southern usually offering more sedate so coral habitats and a larger density of cryptic critters. Komodo is justly famous for its high-energy, adrenaline-pumping dives and the gusting currents that surge and swirl through the deep channels and around the islets and sea mounts between Komodo, Padar and Rinca islands are the key to the park’s wonderful marine life. An experienced dive guide is essential in order to indicate not only the right time and tide to dive, but the correct entry point to gain maximum enjoyment from the dive. 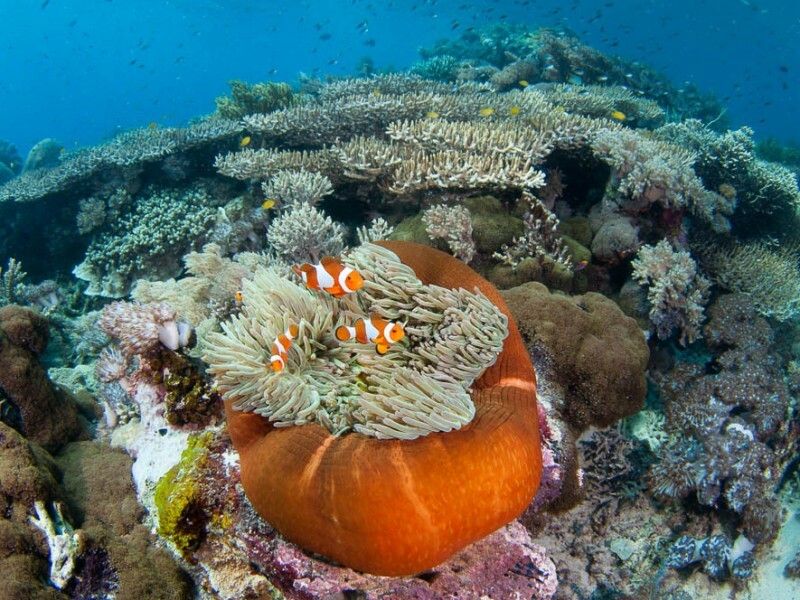 Great visibility, massive cliffs of black basalt, colourful walls and dazzling coral gardens all combine to create one of the most prolific and diverse undersea ecosystems on earth. 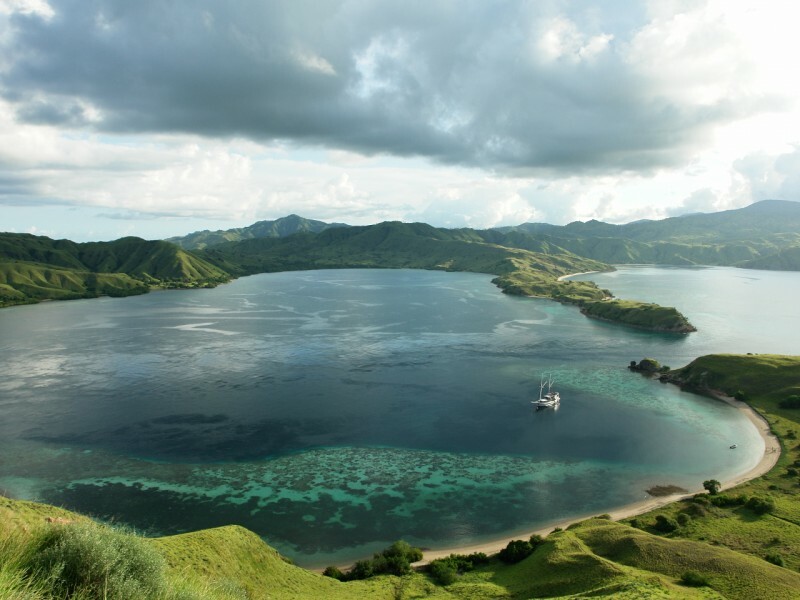 These attributes give Komodo the potential to become one of the world’s ultimate yachting destinations.